Christmas Special with Hometown Sheds Lincolnton! Christmas is right around the corner and Hometown Sheds in Lincolnton, North Carolina has the perfect Holiday gift for the kids this year that they will not only enjoy on Christmas day, but any time of the year! A brand new playset just for them! Hometown Sheds in Lincolnton can install on your property – at no extra charge – a beautifully built and sturdy swingset for all to enjoy! What sizes can we have built? We can install just about any size with any feature you want. It all depends on how awesome you want the playset to be for your family or business. That’s right! 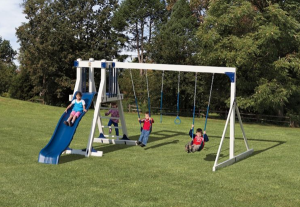 If you have a business or nonprofit and need a play area for your customers children, Hometown Sheds in Lincolnton will supply the need for the perfect swingset for your patrons! Want something just a little simple? No problem! We can install a Frolic Zone PlaySet for as low as $1751. 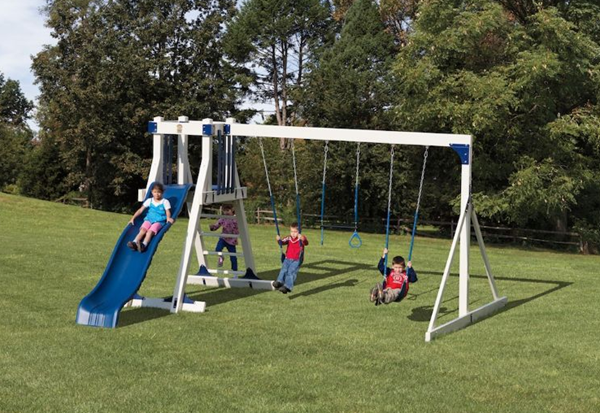 Hometown Sheds in Lincolnton even offers rent to own financing for as low as $110 a month for this great swingset! Standard features for the Frolic Zone playset include: • A-Frame Tower: 3’x3′ with Built-in Ladder • 5′ Deck Height • 10′ Wonder Wave Slide • 3 Position Single Beam 2 Belts Swings • 1 Trapeze Swing What kid would not love this gift?! All playsets purchased through Hometown Sheds in Lincolnton come with a 20 year warranty. The playsets are covered in vinyl to be maintenance free and for safety: no splinters to those little fingers! Call Hometown Sheds Lincolnton today at 704-735-3334 to get your playset ordered today or visit them at 2509 E Main St Lincolnton and pick the perfect package for your business, nonprofit, or home! Learn more about our playsets here!